Airborne forces, as with most elite military units, were not created overnight, but rather, were moulded and shaped by men of foresight, vision and determination. Such a man was Lt Col John Frank Rock RE. Right at the beginning of the war several far-sighted people were beginning to see the potential of airborne forces. The Germans, with their customary efficiency, were the first to realise this potential. But even within the British army the idea was beginning to make sense. Sir Martin Lindsay, then a junior officer, sent a memo to the war office suggesting that a small parachute cadre be set up to study the problems that may arise should they decide to train paratroops. Having been passed all the way up to GIGS, it was returned with the hand-written response "I am not going to ask Englishman to do that". Sir Martin was to become the second army officer to be tasked to build the airborne forces, later to become Brigadier. On the 22nd June 1940, almost 4 years to the day before the D-Day landings, Winston Churchill wrote a minute directing the War Office to form a "corps of at least 5000 paratroops". John Rock would not at first have seemed to be the most obvious choice to be the man to take that job on. Recently returned from Dunkirk as Bde Maj. of 11 Inf. Bde, he had no experience of parachuting or flying. He was born in 1905, the son of a Naval Officer who was killed on active service during WW1. Educated at Imperial Service College and RMA Woolwich, he was commissioned 2Lt RE on 3rd September 1925 and promoted to Lt exactly 2 years later. 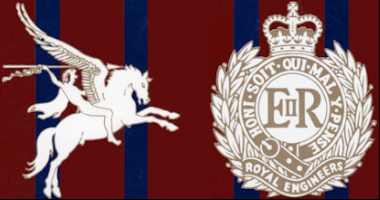 Up to his posting to command 31 Coy on the 27th April 1935, then stationed in Ceylon, he had completed courses in Mounted Duties, Anti Aircraft Defence, Air Photography, small arms and could speak 4 languages including German. He was posted to SME Chatham on 3rd Mar 1938, having since been promoted to Captain, and was to be Assistant Instructor (Construction) until his move to the Staff College in Jan 1939, and his subsequent round trip of France to the beaches at Dunkirk. The Central Landing School was opened at Ringway Airfield, near Manchester, on 21st June 1940, under the command of Sqn Ldr L A Strange assisted by Sqn Ldr J E Benham. 3 days later Maj. Rock and Capt. Lindsay arrived as the senior army officers. Also present at these early days was Capt. W Brandish, Capt. J Lander, some RAF 'enthusiasts' and a few ex-professionals 'stunt jumpers'. No2 commando provided an initial detachment of some men, not all of who were entirely enthusiastic about the idea. A impression of the kind of energy that Rock was capable of may be seen by the fact that the first 'Live' jumps were commenced on 13th July, less than 3 weeks after his arrival. When, a week later, the first fatality occurred, he again showed his mettle by insisting on being the first to jump when training recommenced on 8th August, as he did on all occasions where an injury or fatality threatened the morale and confidence of his troops. 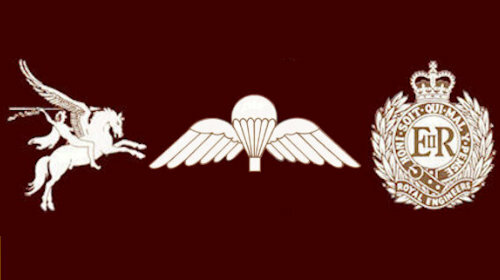 Rock's vision can also be seen in the minutes of a meeting held at Ringway on 19th June 1940 where, among many other items, the issues of extra pay for airborne soldiers, specialised jump clothing such as helmets, boots and the smock, (copies of captured German equipment), redesigned battle dress trousers, the provision of specially trained parachute packers ("These may be women") and the acquisition of the ideally equipped Douglas Dakota aircraft were all raised and dealt with. Even down to considering the need to provide paratroops with gloves, anklets and 'jock straps' for their protection. now focused in this direction. He was appointed CO of the Glider Pilots Regiment on 21st December 1941. From 22nd December 1941 continuously until 9th September 1942 he learned to fly from scratch. Elementary training followed by advanced on Magisters and then converting to Hotspur gliders and finally the large Horsa Gliders. Less than a month later he was to die tragically. On the 27th September 1942, during a night flight at Shrewton, the towrope of his Hotspur Glider broke and he was injured when he crashed into a telegraph pole on landing. He died on 8th October 1942 at Tidworth Hospital. He was 37 years old and unmarried. His next of kin was his sister, then Miss M A Rock. Amazingly his only decorations were the 1939-45 star and medal, awarded posthumously on 8th April 1949. Although he has been largely ignored by the annals of history, his achievements can never be. A Sapper from the outset, not only was he our first parachute soldier but also the first glider soldier. The legacy of pride and ability that he began in 1940 thrives in today's airborne soldiers, not just in our army but in the armies all over the world that have based themselves on his model. 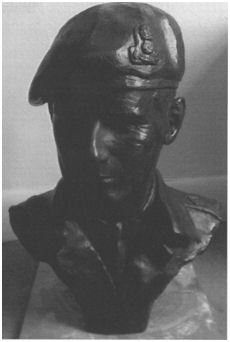 The tradition of ABI 'airborne initiative' that is such a vital component of today's parachute soldier, can be traced directly to the early days at Ringwood and John Rocks inspiration. "The greater part of the credit, on the Army Side, for the success of the initial experiments and trials must go to Major Rock, whose unfailing courage and determination in the face of all difficulties was an inspiration to others". The death from a gliding accident of Lieutenant Colonel John F. Rock is not only a great shock to his friends but a serious loss to our airborne forces, in the technical development of which he played a leading part. In June 1940, Rock was chosen from the Royal Engineers to start parachute troops, and took his share of the risks and mishaps of the early experiments, which have now made the landing of soldiers by parachute comparatively safe. Military gliders grew up around him. and when a Glider Pilot Regiment was formed, he was appointed to command it. He still continued to do more than his share of new development work in spite of at least one serious accident, which might well have deterred a less gallant man. He died in a military hospital on October 8th from multiple injuries received in a crash a fortnight before when making another glider flight of an experimental nature. From UK Imperial Service College Rock went to Woolwich and was commissioned in the Royal Engineers in 1925. 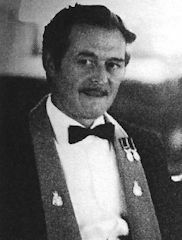 His early career as a sapper subaltern included a period as a Garrison Engineer, construction work in Ceylon, and being an instructor at the School of Engineering. In 1937 he went to Germany and obtained his first class interpretership a year later, shortly before going to the Staff College. During the fighting in France and Belgium he was brigade major of the 11th Infantry Brigade. His father lost his life at sea as a naval surgeon in the last war; his mother, to whom he was devoted, was a great influence in his life. He was unmarried. His death will be deeply felt because of three qualities, which he possessed to a quite exceptional degree: strength of character, ability, and personal charm. It is no exaggeration to say that those of us who served under him came to love him. His work goes on and the better for his inspiration, for he set us an example, which we shall never forget.